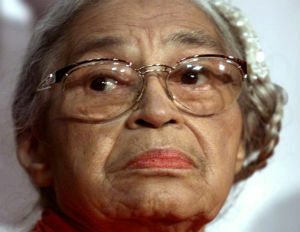 We are now on the fourth day of Black History Month, and on this special day we celebrate Rosa Parks‘ birthday. The Civil Rights leader and activist was born on Feb. 4, 1913 in Tuskegee, Alabama. Parks is most recognized for her contributions during the Civil Rights Movement, and for her extreme bravery that helped pave the way for the desegregation of blacks by her refusal to surrender a bus seat to a white passenger. On that day of her history-making arrest, her bold actions helped spark the Montgomery boycott that led to lasting change in the city. Her parents were both former slaves, and she grew up in a family that strongly stood for racial equality. Parks’ mother taught her to read at an early age, and she later attended a segregated school in Alabama, which contained a separate building for white students. She left school during her junior year of high school to care for her sick grandmother and mom, and eventually landed a job as a seamstress in Montgomery. In 1932 she married Raymond Parks, who was an active member of the NAACP, and he encouraged his wife to participate in the Civil Rights Movement. Parks served as the youth leader and became secretary to the organization’s President E.D. Nixon. On the fateful day of Dec. 1, 1955, she boarded a Montgomery bus to go home after a hard day of work, and sat in one of the first few rows of seats, which were designated for “coloredâ€ passengers. Bus drivers were responsible for assigning seats to passengers, and would often demand blacks give up their seats for whites, and if they protested this they would call police officials. During Parks’ trip home, the bus quickly filled up, and left several white passengers standing in the aisle. The driver stopped the vehicle and yelled at her to get up, to which she replied, “I don’t think I should have to stand up.â€ She was arrested on the spot and charged with violating Chapter 6, Section 11 of the Montgomery City Code, and later that night she was released on bail. On the night of her arrest, Nixon organized a large boycott of all the city’s buses, and members who elected to participate founded the Montgomery Improvement Association, and elected Dr. Martin Luther King Jr. as minister of the Dexter Avenue Baptist Church. Following her 30-minute hearing, where over 500 local supporters gathered in support, Parks was found guilty of violating the city’s ordinance and was fined $10 along with a $4 court fee. The events that followed were even bigger, as the city’s buses were suffering due to the boycott. Her attorney filed a suit which eventually lead to the Brown v. Board of Education which holds that separate but equal policies have no place in public education. On Dec. 20 the boycott ended and the city dismissed the enforcement of segregation on public buses. Rosa Park’s actions that day led to one of the biggest and extremely successful boycotts that helped end racial segregation in the US. She went on to receive the Spingarn Medal and the Martin Luther King Jr. Award, and was also awarded the Presidential Medal of Freedom by President Bill Clinton in 1996. Rosa Parks died on Oct. 24, 2005, but her legacy and symbol of the Civil Rights Movement will forever live on.